CORPOR ATE NOTES PERC PROFILE The ProPane educaTion & research council (Perc) is a check-off Program esTablished, oPeraTed, and funded by The ProPane indusTry. 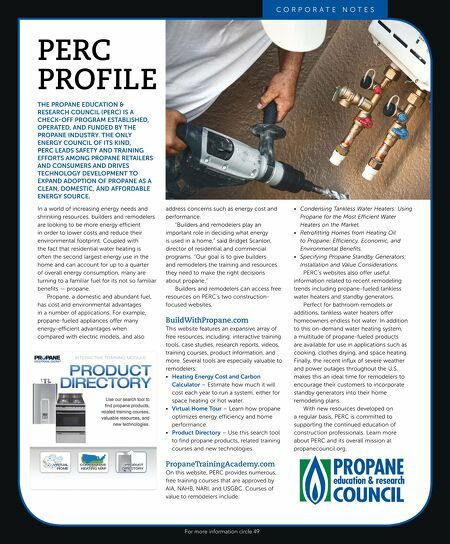 The only energy council of iTs kind, Perc leads safeTy and Training efforTs among ProPane reTailers and consumers and drives Technology develoPmenT To exPand adoPTion of ProPane as a clean, domesTic, and affordable energy source. In a world of increasing energy needs and shrinking resources, builders and remodelers are looking to be more energy efficient in order to lower costs and reduce their environmental footprint. Coupled with the fact that residential water heating is often the second largest energy use in the home and can account for up to a quarter of overall energy consumption, many are turning to a familiar fuel for its not so familiar benefits — propane. Propane, a domestic and abundant fuel, has cost and environmental advantages in a number of applications. For example, propane-fueled appliances offer many energy-efficient advantages when compared with electric models, and also address concerns such as energy cost and performance. "Builders and remodelers play an important role in deciding what energy is used in a home," said Bridget Scanlon, director of residential and commercial programs. "Our goal is to give builders and remodelers the training and resources they need to make the right decisions about propane." Builders and remodelers can access free resources on PERC's two constructionfocused websites. BuildWithPropane.com This website features an expansive array of free resources, including: interactive training tools, case studies, research reports, videos, training courses, product information, and more. Several tools are especially valuable to remodelers: • heating energy cost and carbon calculator – Estimate how much it will cost each year to run a system, either for space heating or hot water. • virtual home Tour – Learn how propane optimizes energy efficiency and home performance. • Product directory – Use this search tool to find propane products, related training courses and new technologies. PropaneTrainingAcademy.com On this website, PERC provides numerous, free training courses that are approved by AIA, NAHB, NARI, and USGBC. Courses of value to remodelers include: For more information circle 49 • CondensingTanklessWaterHeaters:Using PropanefortheMostEfficientWater HeatersontheMarket. • RetrofittingHomesfromHeatingOil toPropane:Efficiency,Economic,and EnvironmentalBenefits. 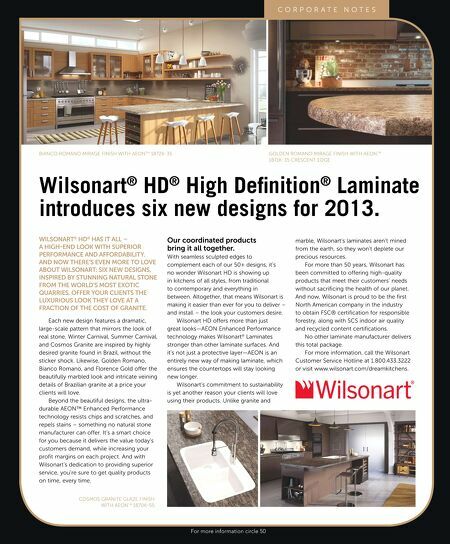 • SpecifyingPropaneStandbyGenerators: InstallationandValueConsiderations. PERC's websites also offer useful information related to recent remodeling trends including propane-fueled tankless water heaters and standby generators. Perfect for bathroom remodels or additions, tankless water heaters offer homeowners endless hot water. In addition to this on-demand water heating system, a multitude of propane-fueled products are available for use in applications such as cooking, clothes drying, and space heating. Finally, the recent influx of severe weather and power outages throughout the U.S. makes this an ideal time for remodelers to encourage their customers to incorporate standby generators into their home remodeling plans. With new resources developed on a regular basis, PERC is committed to supporting the continued education of construction professionals. Learn more about PERC and its overall mission at propanecouncil.org.